Tranquility. The World English Dictionary defines it as “a state of calm or quietude.” Most of us search for those islands of tranquility in our busy lives. For some it is achieved through meditation, music, physical activity, journaling or hobbies. I was always a bit envious of those people. My mind never stops so meditation and music don’t do it for me. Those who know me can testify that I hate to sweat (in the South we call it glistening) so physical activity is a big NO. My perfectionism and tendency toward boredom once I master something ruled out most of the other options. At the ripe old age of 49, I figured this just wasn’t in the cards for me. But life has a way of turning things upside down leaving you scrambling to assemble the pieces of your identity into a new reality. In September of 2010, on a perfectly ordinary Monday afternoon, my family was turned upside down. We came within a whisper of losing our oldest daughter and her two children in a horrific auto accident. As mothers are wont to do, I was the one who kept it all together. It is who I am – the one my family can always count on. All three of them recovered through the grace of God, prayers from friends and strangers around the world, and amazing medical professionals. However, our family was forever changed by the experience – mostly for the better. While we were always a strong family, this gave each of us a much deeper appreciation for each other and an awareness how quickly things change. In many ways, it was a loss of innocence for us as well. So how does this relate to my quest for tranquility? About two months after the accident, the emotions I had switched off to deal with the crisis decided it was time to make an appearance – all at once. I struggled to find a way to deal with the maelstrom roiling in my brain. Then, in mid-November, a friend posted a link on Facebook. It was a video demonstrating Zentangle- how to draw the tangle “Betweed” by Zentangle founders Maria Thomas and Rick Roberts. There was an effortless magic to the drawing. I had to try it – something about it called to my soul. 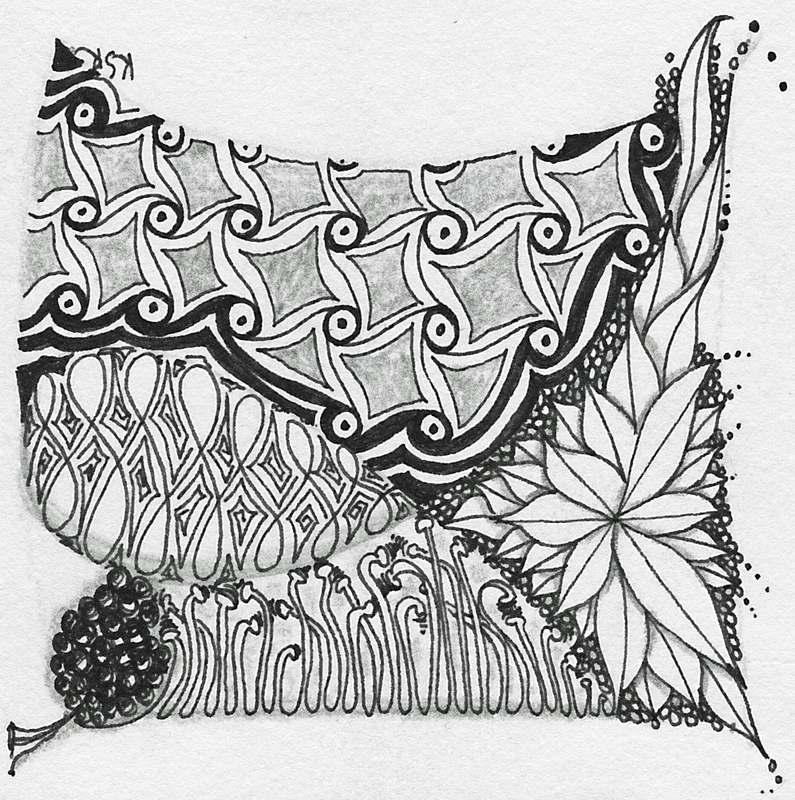 As I explored the world of Zentangle and began to actively create my own works of art, I discovered something amazing. When I was tangling, my mind would quiet and begin to calm. Blessed Tranquility. And so I begin…sharing my Tangled Tranquility with others and trying to pay it forward in my corner of the world. Thank you for joining me.